Joy joy, a dark pink delicate single bloom. If you love bees the bees will be all over this one. 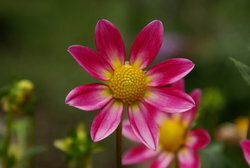 This Dahlia will give you the chance to see all the different wild bees at your farm or neighborhood planting bed .